Jade Idol Video Slot Review - Casino Answers! Jade Idol is a 5-reel, 9-line video slot developed by Cryptologic, featuring two wild symbols, scatter wins, multipliers, a free spins feature and a bonus game. You can play the Jade Idol video slot at [Americans: Unfortunately due to legal restrictions you are unable to play at any of the online casinos this game is at. We recommend you trying playing the unique slots at Win A Day Casino instead.]. Jade Idol is a nickel slot. Bets on the Jade Idol slot machine are $0.05, $0.10, $0.25, $1, $2 and $5 per line. You can select up to 9 lines on the Jade Idol video slot. The minimum total bet is a nickel and the maximum total bet is $45 per spin. The Jade Idol casino game has a decent betting range that will suit most – if not all – online slots players. To play the Jade Idol online slot, select your bet with the “Bet” and “Lines” arrows and press the “Spin” button. Players can also play all 9 paylines quickly by pressing the “Bet Max” button to spin the reels. The top-paying symbol on the Jade Idol video slot is the Diamond symbol. Have 5 Diamond symbols appear on a selected payline and you will win Jade Idol’s 10,000 coin top jackpot. The second highest paying symbol is the Ship, which can pay out up to 2500 coins for 5 symbols. Other high paying symbols on the Jade Idol slot machine include the Fan and Lantern symbols, which will both pay out up to 1000 coins. The Skyline is the scatter symbol on Jade Idol. You can receive a scatter payout by landing two Scattered Skylines anywhere on the reels. You can win up to 100X your bet by hitting five scatter symbols. The Jade Idol slot game has two wild symbols. The Kitty wild symbol appears on reels 1 through 4. The Monkey wild symbol appears on reel 5. Both symbols will substitute for all symbols except for the Scattered Skyline symbol. When the Kitty symbol appears on reel 1 at the same time the Monkey symbol appears on reel 5, you will win 5 free spins at a 2X multiplier. All prizes are doubled during the Jade Idol free spins feature. The feature can be re-triggered. Free spins are played at the lines and bet of the triggering spin. Free spins feature wins are added to payline and scatter wins. To try and win lots of free cash on the Jade Idol free spins feature, play now at [Americans: Unfortunately due to legal restrictions you are unable to play at any of the online casinos this game is at. We recommend you trying playing the unique slots at Win A Day Casino instead.]! Payouts are made according to the Paytable. Payline wins are multiplied by the bet per line. Scatter wins are multiplied by the total bet. Scatter wins are added to payline wins. Scatter wins are paid independent of the paylines selected. All symbols pay left to right only in consecutive order, except for the scatter symbol (which pays any). Only the highest win is paid per selected payline. Coinciding wins on different paylines are added. The Jade Idol online slot has a basic autoplay mode with no advanced settings. Use the arrows to select from 1 up to 99 autoplay spins. To start your autoplay spins, press either “Spin” or “Bet Max.” You can stop the Jade Idol autoplay spins at any time by pressing the “Stop” button to the right of the autoplay counter. 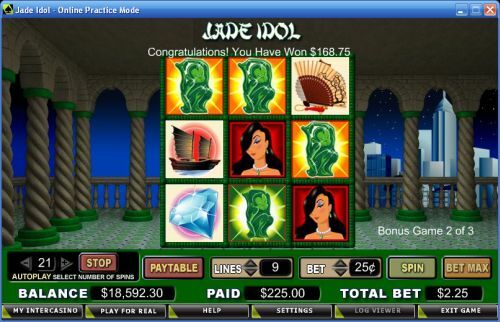 Jade Idol is a solid video slot offering from Cryptologic. With a prize of 10,000 coins, a free spins feature and a bonus game, the Jade Idol slot game has enough special features to keep most slots players’ attention. To play the Jade Idol video slot, you can sign up today at [Americans: Unfortunately due to legal restrictions you are unable to play at any of the online casinos this game is at. We recommend you trying playing the unique slots at Win A Day Casino instead.]. Are players from the USA allowed to play the Jade Idol video slot for real money? No, players from the United States are not able to play the Jade Idol slot machine for real money at this time. For an alternative, we recommend you try playing at RTG online casinos such as Bovada. Is there a free flash game of Jade Idol that I can play in my web browser? 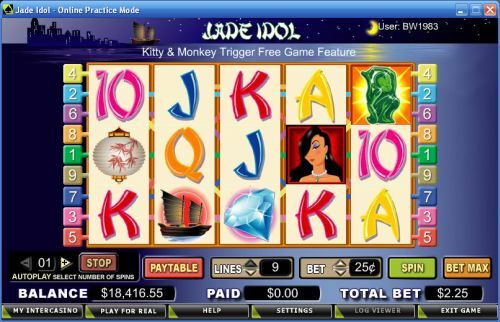 Yes, Jade Idol is currently being offered as an instant play slot machine at [Americans: Unfortunately due to legal restrictions you are unable to play at any of the online casinos this game is at. We recommend you trying playing the unique slots at Win A Day Casino instead.]. You can play Jade Idol Slots for free or real money. If you have any problems with the flash casino, it is highly recommended that you download the newest version of Adobe Flash Player for the best performance possible.